That’s sweet…okay, maybe not *sweet* but definitely a treat! I enjoy checking out a few blogs as I drop entrecards and her blog almost always slows me down. So, I need to pass the award along and nominate up to ten blogs which show great attitude/gratitude. 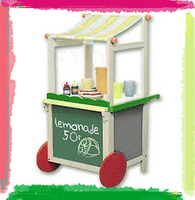 § 6 Responses to >Making Lemonade..
>Congrats! And Thanks for passing it along, too! >An attitude of gratitude – I like that!Thanks! Love your blog and beads. « >The lure of odd lots..
You are currently reading >Making Lemonade.. at fireandglass.